We’d like to share a little design secret: in order to have a beautiful home and a calm, ordered life you need to have places to stash away all the junk! Seriously though, having well designed storage solutions can allow your home and life to be free of clutter. Providing a place for everything is often one of our biggest design challenges. 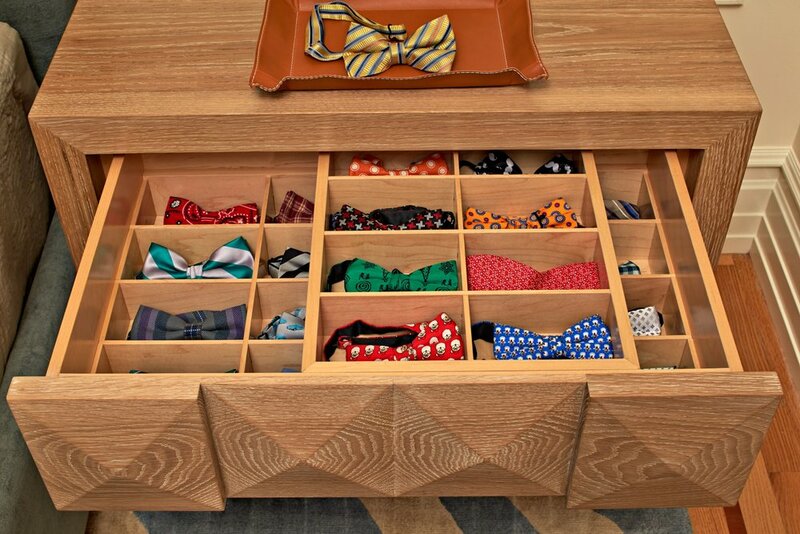 Whether it is coats or boots or bow ties, finding creative ways to accommodate all the necessities of life can result in some very unusual and dynamic design solutions. Here are a few examples of designs which were driven by clients’ unique storage needs. 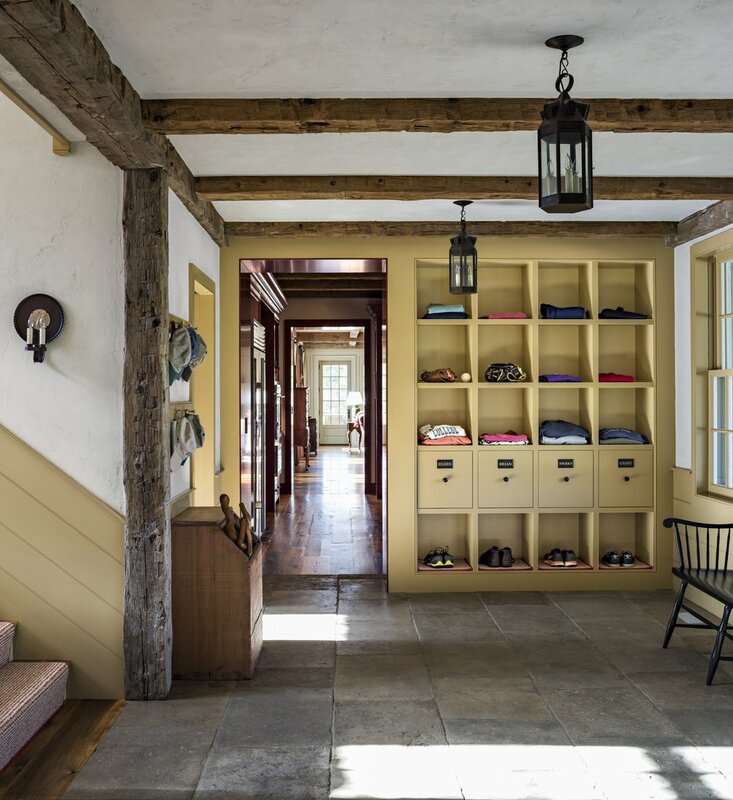 For a Connecticut country retreat, the Mud Room is the most essential room of the house. For this active family of six, we needed to accommodate countless shoes, sweatshirts and parkas while presenting an attractive entrance to their new home. To provide order we created a series of floor to ceiling “cubbies”, one column for each member of the family. A small drawer offers a place for keys and mittens, with an outlet above for recharging cell phones. Two rows of pegs on the opposite wall insure that even the youngest members of the family can easily hang their coats. An antique A&P tea bin is a great place to store the children’s baseball bats & mitts. Having a place for everything is very important, but being able to find everything quickly is just as important. 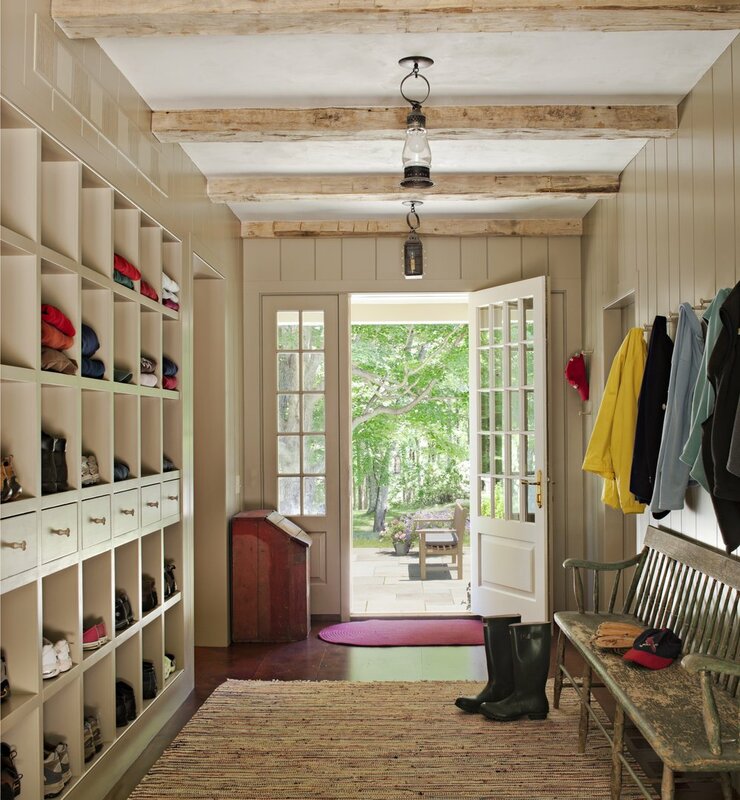 Engraved name plates in this Mud Room insure that every family member can quickly find their shoes and sweatshirts. Even the family dog has a designated drawer for her leash and toys. Carpet inserts on the bottom row of cubbies absorb moisture from winter boots. Rows of pegs offer quick and easy storage for caps. The Shakers were masters of designing clean and simple storage solutions. This Dressing Room was inspired by their creativity. Built-in drawers are flanked by wardrobe-style closets. The arrangement is repeated on the opposite wall. A rustic antique farm table in the center serves as a make-up area. Providing for the smallest details can often make the greatest impact on your daily routine. 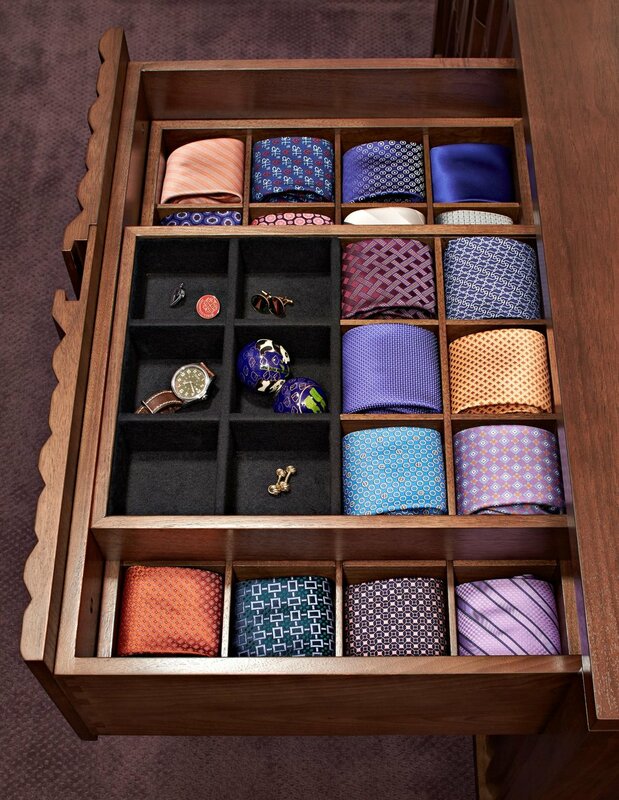 The custom drawer inserts on the left allow for neckties, watches and cufflinks to be easily viewed. The inserts on the right accommodate a teenage boys’ extensive collection of bow ties. Precious items require extra care. 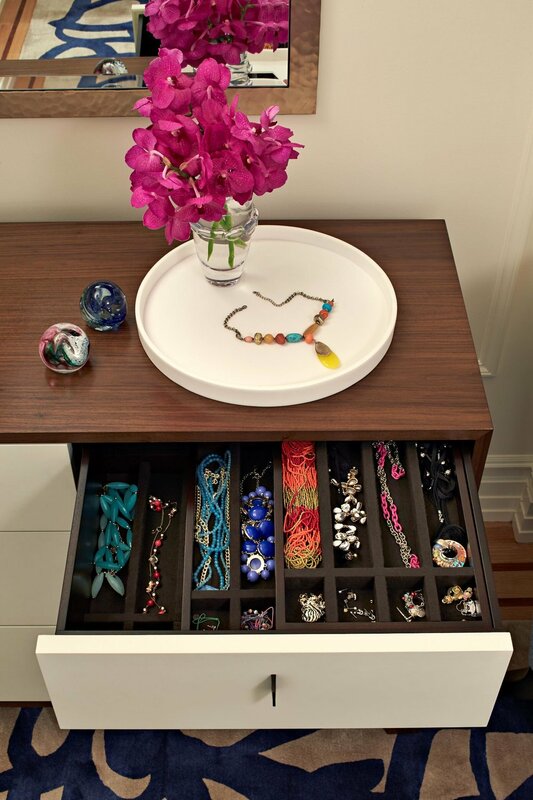 For a teenage girl, the custom velvet-lined drawer inserts on the left allow her jewelry to be easily viewed and prevent tangles and scratches. The silverware inserts on the right make setting the table so much easier. We seek out every opportunity to create useful storage. 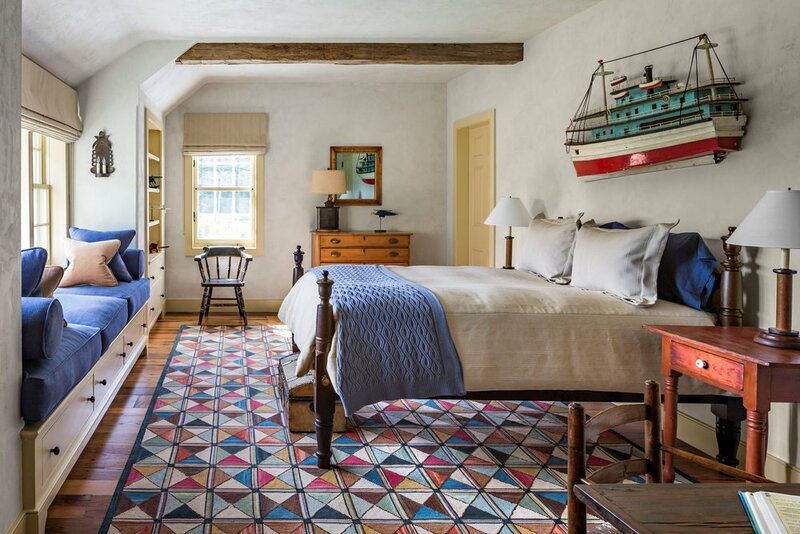 The row of drawers below the windowseat in this boy's bedroom are great for storing extra blankets and pillows. Ample shelving in this Study not only provides for books, but is a great way to organize a collection of small antiques, family photos & memorabilia. Even the most utilitarian spaces deserve extra care. Rows of pegs in this Potting Shed accommodate gardening tools and slickers. Open shelves are great for stacking pots. Deep drawers keep the counter free for potting and arranging flowers.